Announcement Here you will find 8x10 inch Printable Coloring Sheets, printable greeting cards and 4x6 inch Digi-Stamps, for your coloring and crafting pleasure. Here you will find 8x10 inch Printable Coloring Sheets, printable greeting cards and 4x6 inch Digi-Stamps, for your coloring and crafting pleasure. Very pretty. I enjoyed coloring it. Perfect for what I am working, and the detail is stunning. Perfect for what I am working on, love the kitties and fairies together. vielen dank für diesen digitalen stempel, werde ihn auf meinen karten verwenden. The magic of nature is what inspires me. From the little hummingbirds that visit my garden in summer to the great horned owls heard throughout the winter nights...there is magic in the air! In 2010 I discovered the art of Zentangle and began combining "tangling" with my fantasy drawings, thus "Fairy-Tangles™" was born. I received my Zentangle Teacher Certification in October 2011 at the 7th Zentangle Teacher Training Program held in Providence Rhode Island. I am the author of "Paper Dolls Fashion Workshop" and a contributing author to The Art of Zentangle and The Art of Fashion Tangling, all published through Walter Foster Publishing. 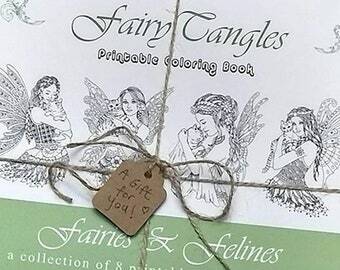 I recently illustrated two adult coloring books, Messages from Your Angels and Messages from The Fairies, both published through Hay House Publishing and available on Amazon. Currently I am working on a third coloring book, Messages from the Mermaids, that will be released in August of 2017. Several years ago I started designing rubber stamps for Sweet Pea Stamps and then decided to release my designs as digital stamps and coloring sheets. Which are exclusively found here in my Etsy Shop. I love to create. I enjoy drawing and painting as well as "tangling" and have taught art classes to adults and children as well as classes in jewelry making. The magic of nature is what inspires me. I first discovered the art of Zentangle in the winter of 2010 and began combining "tangling" with my fantasy art and thus "Fairy-Tangles™" was born. If you're not totally satisfied with you purchase, you may return it within 7 days for a full refund. You will have to pay for the return shipping. Digital Downloads (coloring sheets and digi-stamps) are not eligible for refunds. I ship USPS first class. ACEO cards are packed in a hard protective sleeve. My prints are very high quality. Great care it taken in scanning the original art work.